The Embraer E-Jet family is a series of narrow-body short- to medium-range twin-engine jet airliners, carrying 66 to 124 passengers commercially, manufactured by Brazilian aerospace manufacturer Embraer. The aircraft family was first introduced at the Paris Air Show in 1999 and entered production in 2002. The series has been a commercial success primarily due to its ability to efficiently serve lower-demand routes while offering many of the same amenities and features of larger jets. The aircraft is used by mainline and regional airlines around the world but has proven particularly popular with regional airlines in the United States. Embraer first disclosed that it was studying a new 70-seat aircraft, which it called the EMB 170, in 1997, concurrently with announcing the development of its ERJ 135. The EMB 170 was to feature a new wing and larger-diameter fuselage mated to the nose and cockpit of the ERJ 145. The proposed derivative would have cost $450 million to develop. While Alenia, Aerospatiale and British Aerospace through AI(R) were studying the Airjet 70 based on the ATR 42/72 fuselage for a 2,200 km (1,200 nmi) range, AI(R) and Embraer were studying a joint development of a 70-seater jet since their separate projects were not yet launched. In February 1999, Embraer announced it had abandoned the derivative approach in favour of an all-new design. The E-jet family was formally launched at the Paris Air Show on 14 June 1999 as the ERJ-170 and ERJ-190, designations later changed to Embraer 170 and Embraer 190. Launch customers for the aircraft were the French airline Régional Compagnie Aérienne Européenne with ten orders and five options for the E170; and the Swiss airline Crossair with an order for 30 E170s and 30 E190s. Production of parts to build the prototype and test airframes began in July 2000. The first prototype (PP-XJE) rolled out on October 29, 2001  at São José dos Campos, Brazil. Its first flight occurred 119 days later on February 19, 2002, marking the beginning of a multi-year flight test campaign. The aircraft was displayed to the public in May 2002 at the Regional Airline Association convention. Full production began in 2002, at a new factory built by Embraer at its São José dos Campos base. After a positive response from the airline community, Embraer launched the E175, which stretched the fuselage of the E170 by 1.78 metres (5.8 ft). The first flight of the E175 took place on June 2003. 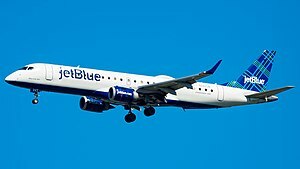 In 2003, JetBlue ordered 100 Embraer 190s, delivered from 2005. After several delays in the certification process, the E170 received type certification from the aviation authorities of Brazil, Europe and the United States in February 2004. The first E175 was delivered to Air Canada and entered service in July 2005. In 2008, the 400th E-jet was delivered to Republic Airlines in the U.S. In September 2009, the 600th E-jet built was delivered to LOT Polish Airlines. On October 10, 2012, Embraer delivered the 900th E-Jet to Kenya Airways, its 12th Ejet. On 13 September 2013, the delivery of the 1,000th E-jet, an E175 to Republic Airlines for American Eagle, was marked by a ceremony held at the Embraer factory in São José dos Campos, with a special "1,000th E-Jet" decal above the cabin windows. On 6 December 2017, the 1,400th E-Jet was delivered, an E175; it had a backlog of over 150 firm orders on 30 September 2017. On 18 December 2018, Embraer delivered the 1,500th E-Jet, an E175 to Alaska Air subsidiary Horizon Air, as Embraer claims a 80% market share of the North American 76-seaters. By then, the fleet had completed 25 million flight hours in 18 million cycles (an average of 1.4 h) with a 99.9% dependability. On 14 October 2017, an Airlink Embraer E190-100IGW with 78 passengers aboard inaugurated the first scheduled commercial airline service in history to Saint Helena in the South Atlantic Ocean, arriving at Saint Helena Airport after a flight of about six hours from Johannesburg, South Africa, with a stop at Windhoek, Namibia. The flight began a once-a-week scheduled service by Airlink between Johannesburg and Saint Helena using Embraer 190 aircraft. The inaugural flight was only the second commercial flight to Saint Helena in the island's history, and the first since a chartered Airlink Avro RJ85 landed at Saint Helena Airport on 3 May 2017. In November 2011, Embraer announced that it would develop revamped versions of the E-Jet to be called the E-Jet E2 family. The new jets would feature improved engines that would be more fuel efficient and take advantage of new technologies. Beyond the new engines, the E2 family would also feature new wings, improved avionics, and other improvements to the aircraft. The move came amid a period of high global fuel costs and better positions Embraer as competitors introduced new and more fuel efficient jets, including the Mitsubishi Regional Jet. The new aircraft family also includes a much larger variant, the E195-E2 capable of carrying between 120 and 146 passengers. This jet better positions Embraer against the competing Airbus A220 aircraft. The PW1000G was previously selected for use on competing aircraft. In January 2013, Embraer selected the Pratt & Whitney PW1000G geared turbofan engine to power the E2 family. On February 28, 2018, The E190-E2 received its type certificate from the ANAC, FAA and EASA. It is scheduled to enter service in the second quarter of 2018. The Embraer E-Jets line is composed of two main commercial families and a business jet variant. The smaller E170 and E175 make up the base model aircraft. The E190 and E195 are stretched versions, with different engines and larger wing, horizontal stabilizer and landing gear structures. The 170 and 175 share 95% commonality, as do the 190 and 195. The two families share near 89% commonality, with identical fuselage cross-sections and avionics, featuring the Honeywell Primus Epic Electronic flight instrument system (EFIS) suite. The E-jets also have winglets to improve efficiency. All E-Jets use four-abreast seating (2+2) and have a "double-bubble" design, which Embraer developed for its commercial passenger jets, that provides stand-up headroom. The E190/195 series of aircraft have capacities similar to the initial versions of the McDonnell Douglas DC-9 and Boeing 737. The E-Jets have turbofan engines designed to reduce noise, which allows them to operate in airports that have strict noise restrictions, such as London City Airport. At 185 sq in (11.9 dm2), the E-Jet windows are larger than the 175 sq in (11.3 dm2) Boeing 787 windows. The E170 is the smallest aircraft in the E-Jet family and was the first to enter revenue service in March 2004. As of 2017, the E170 is largely out of production. 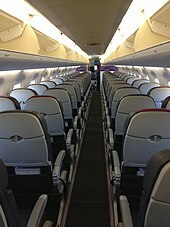 The E170 typically seats around 72 passengers in a typical single class configuration, 66 in a dual class configuration, and up to 78 in a high density configuration. The E170 directly competes with the Bombardier CRJ700 and loosely with the turboprop Bombardier Q400. The jet is powered with General Electric CF34-8E engines of 14,200 pounds (62.28 kN) thrust each. The E175 is a slightly stretched version of the E170 and first entered revenue service in July 2005. The E175 typically seats around 78 passengers in a typical single class configuration, 76 in a dual class configuration, and up to 88 in a high density configuration. Like the E170, It is powered with General Electric CF34-8E engines of 14,200 pounds (62.28 kN) of thrust each. It competes with the Bombardier CRJ900 in the market segment previously occupied by the earlier BAe 146 and Fokker 70. In late 2017, Embraer announced the E175SC (special configuration), limited to 70 seats like the E170 to take advantage of the E175 performance improvements, but still comply with US airline scope clauses limiting operators to 70 seats. Embraer is marketing the E175SC as a replacement for the older 70-seat Bombardier CRJ700 with better efficiency and a larger first class. In 2018, a new E175 has a value of $27 million, projected to fall to $3-8 million 13 years later due to their concentration in the US with more than 450 in service within 560, with Republic and SkyWest operating over 120 each, Compass 55 and Envoy Air 45, after the similar experience with the CRJ200 and ERJ 145 demonstrates the limited remarketing opportunities. The E190/195 models are a larger stretch of the E170/175 models fitted with a new, larger wing, a larger horizontal stabilizer, two emergency overwing exits, and a new engine, the GE CF34-10E, rated at 18,500 lb (82.30 kN). These aircraft compete with the Bombardier CRJ-1000 and Airbus A220-100, the Boeing 717-200 and 737-600, and the Airbus A318. It can carry up to 100 passengers in a two-class configuration or up to 124 in single-class high density configuration. The first flight of the E190 was on March 12, 2004 (PP-XMA), with the first flight of the E195 (PP-XMJ) on December 7 of the same year. The launch customer of the E190 was New York-based low-cost carrier JetBlue with 100 orders options in 2003 and took its first delivery in 2005. British low-cost carrier Flybe was the first operator of the E195, had 14 orders and 12 options, and started E195 operations on 22 September 2006. Flybe have since decided that they would remove the aircraft from their fleet in favour of the Dash 8 Q400 and Embraer 175, in an effort to reduce costs, by 2020. Air Canada operates 25 E190 aircraft fitted with 9 business-class and 88 economy-class seats as part of its primary fleet. JetBlue, American Airlines, and Georgian Airways also operate the E190 as part of their own fleet. Austrian Airlines have 17 E195 aircraft in their mainline fleet. By 2018, the first E190s value was below $10 million and can be leased below $100,000, while most recent ones are worth $30 million and can be leased for less than $200,000 per month. On 2 May 2006, Embraer announced plans for the business jet variant of the E190, the Embraer Lineage 1000 (type name ERJ190-100 ECJ). It has the same structure as the E190, but with an extended range of up to 4,200 nmi, and luxury seating for up to 19. It was certified by the USA Federal Aviation Administration on 7 January 2009. The first two production aircraft were delivered in December 2008. Embraer considered producing an aircraft which was known as the E195X, a stretched version of the E195. It would have seated approximately 130 passengers. The E195X was apparently a response to an American Airlines request for an aircraft to replace its McDonnell Douglas MD-80s. Embraer abandoned plans for the 195X in May 2010, following concerns that its range would be too short. Embraer 170 (E170 or EMB 170-100)— 190 Embraer 170 aircraft have been delivered, with 1 additional jet under a firm order. Major operators include: Republic Airline (59), J-Air (18), S7 Airlines (17), HOP! (15), and Aeroméxico Connect (13). Embraer 175 (E175 or EMB 170-200)— 511 Embraer 175 aircraft have been delivered, with an additional 92 under firm order. 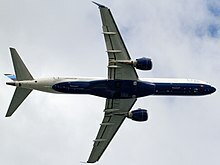 Major operators include: SkyWest Airlines (131), Republic Airline (129), Mesa Airlines (60), Compass Airlines (North America) (56), and Envoy Air (44). Major firm orders include 45 aircraft for SkyWest Airlines and 30 for Horizon Air. Embraer 190 (E190 or EMB 190-100)— 549 Embraer 190 aircraft have been delivered, with an additional 43 under firm order. Major operators include: JetBlue (60), Aeroméxico Connect (48), Tianjin Airlines (32), KLM Cityhopper (32), Buta Airways (8),and Austral Lineas Aereas (26). Major firm orders include 24 aircraft for JetBlue. Embraer 195 (E195 or EMB 190-200)— 164 Embraer 195 aircraft have been delivered, with an additional 5 under firm order. Major operators include: Azul Brazilian Airlines (54), Austrian Airlines (17), Tianjin Airlines (17), Air Dolomiti (12) and Air Europa Express (11). Major firm orders include 6 aircraft for LOT Polish Airlines. Source: Embraer's order book as of December 31st, 2018. On 18 February 2007, Shuttle America Flight 6448 (an E170 operating for Delta Connection) ran off the runway on landing at Cleveland Hopkins International Airport, Ohio in poor visibility during a snowstorm. None of the 75 passengers and crew aboard were injured, and the aircraft, while significantly damaged, was repaired and returned to service. On 17 July 2007, Aero República Flight 7330 overran the runway while landing at Simón Bolívar International Airport in Santa Marta, Colombia. The E190 slid down an embankment off the side of the runway and came to rest with the nose in shallow water. The aircraft was damaged beyond repair, but all 60 aboard evacuated unharmed. On 24 August 2010, Henan Airlines Flight 8387, an E190 that departed from Harbin, People's Republic of China, crash landed about 1 km short of the runway at Yichun Lindu Airport, resulting in 44 deaths. On 16 September 2011, an E190 operated by TAME landed long and ran off the end of the runway at Mariscal Sucre International Airport in Quito, colliding with approach equipment and a brick wall. The crew reportedly failed to adhere to the manufacturer's procedures in the event of a flap malfunction, continuing the approach in spite of the aircraft's condition. Eleven of the 103 aboard received minor injuries, and the aircraft was written off. On 29 November 2013, LAM Mozambique Airlines Flight 470, an E190, crashed in Namibia, killing all 33 aboard (27 passengers, 6 crew members) by the deliberate actions of the pilot. The first officer reportedly left the cockpit to use the bathroom. He was then locked out by the captain, who dramatically reduced the aircraft's altitude and ignored various automated warnings ahead of the high-speed impact. On 4 December 2016, SkyWest Airlines flight 5588, an E175 operating as a United Express flight from Houston Intercontinental Airport, TX to Monterrey, Mexico, was diverted to San Antonio, TX after experiencing an abnormal landing gear indication. Upon landing, the nose gear of the aircraft collapsed, and the aircraft came to rest on runway 04. Of the 51 passengers and 4 crew members, only one minor injury was sustained during the evacuation. During recovery of the aircraft, it was discovered that a failed downlock spring on the nose gear had prevented the landing gear from locking in the down position. On 31 July 2018, Aeroméxico Connect Flight 2431, an E190 bound for Mexico City, crashed in Durango, Mexico shortly after takeoff. 99 passengers and 4 crew were on board. Although there were no fatalities, the aircraft was destroyed by the ensuing fire. The cause of the crash is currently under investigation. 72@32" - 78@30-33" 78@32" - 88@29" 100@31/32" - 114@29/30” 116@31/32" - 124@29-31"
^ a b "Embraer Delivers its 1,500th E-Jet to Horizon Air" (Press release). Embraer. Dec 18, 2018. ^ a b "Embraer ERJ-170". Flug Revue. Archived from the original on 3 February 2010. ^ Aircraft Value News (April 18, 2016). "E170 Values Experience Downward Trend". ^ "American orders 10 E175s". Flightglobal. 31 Oct 2017. ^ "Embraer Marks One Year of E190 Operations in Japan With E190 Firm Order From JAL" (Press release). Embraer. Jun 20, 2017. ^ Linda Blachly (Dec 8, 2017). "Belavia to add one Embraer E195 for route expansion". Aviation Week Network. ^ Walker, Karen; Lopez, Ramon (12 March 1997). "Embraer seeks Paris show launch for new 37-seat regional turbofan". Flight International. 151 (4565). Reed Business Information. p. 4. ^ "Paris report '97: Continental Express is eager for small regional jet". Flight International. 151 (4579). Reed Business Information. 25 June 1997. p. 10. ^ Max Kingsley-Jones (2 July 1997). "Reversal of fortunes". Flight International. ^ "AI(R) and Embraer start talks on joint 70-seat regional-jet". Flight International. 25 June 1997. ^ a b c Paul Lewis (23 Oct 2001). "New by design". Flight International. ^ a b "Embraer 170". Embraer Historical Center. ^ "Embraer 170/175 - MSN 1 - PP-XJE". airfleets.net. ^ Kingsley-Jones, Max; Wastnage, Justin (28 August 2001). "World Airliners: Regional Realities" (PDF). Flight International. 160 (4795): 49. ^ Linares, Luis (2017-04-14). "Flashback Friday: The Embraer E-Jet Family". Airways Magazine. Retrieved 2017-11-11. ^ a b Polek, Gregory (March 30, 2007). "Embraer 170 finds its bearings as first airplanes enter service". ainonline.com. Aviation International News. Retrieved 30 October 2013. ^ "EMBRAER DELIVERS TWO EMBRAER 170 JETS TO US AIRWAYS" (Press release). São José dos Campos, Brazil: Embraer. 8 March 2004. Retrieved 30 October 2013. ^ a b Polek, Gregory (16 September 2013). "Embraer Sets Sights Beyond 1,000th E-Jet Delivery". ainonline.com. Aviation International News. Retrieved 30 October 2013. ^ "600th production E-Jet delivered to LOT - News". Shephard Media. 2009-09-15. ^ "Kenya Airways receives Embraer's 900th E-Jet". CAPA. 2012-10-10. Retrieved 10 July 2014. ^ Baldwin, Bernie (October–November 2013). "On to the next 1,000". Low-Fare & Regional Airlines. 30 (5): 14. ^ @embraer (6 Dec 2017). "We delivered #EJet 1,400 today. @AmericanAir subsidiary #EnvoyAir will fly the #E175 for American Eagle" (Tweet) – via Twitter. ^ Mutzabaugh, Ben (2008-11-07). "JetBlue sets world record with McCain-Palin campaign plane". Usatoday.com. Retrieved 2012-10-16. ^ "First flight lands on remote St Helena". BBC News. 14 October 2017 – via www.bbc.com. ^ "Embraer Commits to re-engined E-Jets". Flight Global. November 10, 2011. ^ Arvai, Ernest S.; Schonland, Dr. Addison M. (2016-11-10). Embraer E-Jets E2: Building on Success. AirInsight. ISBN 9781539631583. ^ Polek, Gregory (January 8, 2013). "Embraer To Re-engine E-Jets with Geared Turbofan". AINonline. Retrieved January 8, 2013. ^ "Pratt & Whitney wins contract for Embraer's new E-Jets". Reuters. 8 January 2013. Retrieved January 8, 2013. ^ "Embraer E190-E2 Granted Certification by ANAC, FAA and EASA" (Press release). Embraer. Feb 28, 2018. ^ "Embraer Selects Pratt & Whitney's PurePower Engines for Second Generation of E-Jets". Embraer. January 8, 2013. Archived from the original on January 23, 2013. Retrieved March 5, 2013. ^ "List of permitted aircraft on LCY" (PDF). Archived from the original (PDF) on 2014-08-01. ^ "Embraer 175 Two-Class Aircraft Information | Alaska Airlines". Alaska Airlines. Retrieved 2018-03-26. ^ Hemmerdinger, Jon (2 October 2017). "SkyWest orders another 20 E-Jets". Flightglobal.com. Retrieved 10 November 2017. ^ Hemmerdinger, Jon (26 September 2017). "Embraer targets CRJ700 operators with new E175-SC". Flightglobal. ^ Aircraft Value News (November 12, 2018). "E175 Concentration Starts to Impact Values". ^ a b "E195 Cabin" (PDF). Embraer. June 2013. Archived from the original (PDF) on 2015-09-24. ^ a b "RAB - Registro Aeronautico Brasileiro". ANAC. Archived from the original on 2011-02-04. Retrieved 2011-01-31. ^ "About our fleet". flybe.com. 2007. Archived from the original on 2008-02-24. Retrieved 2008-05-23. ^ "Flybe to cut aircraft fleet to 70 by 2020". Travel Weekly. 17 May 2018. ^ "Austrian Airlines Fleet - Embraer 195". austrian.com. 2019. Retrieved 2019-01-08. ^ "Aircraft Asset Assessment Embraer E190". Aircraft Value News. October 29, 2018. ^ Kirby, Mark (January 2010). "Proposed stretch dubbed E-195X by Embraer". Retrieved 2010-01-26. ^ "Embraer kills 195X over range concerns". Flight International. 2010. Retrieved 2010-05-14. ^ "Aircraft » SkyWest Airlines". www.skywest.com. ^ "Embraer E-Jet Orders and Deliveries" (PDF). ^ "ASN Aircraft accident Embraer ERJ 170-100SE (ERJ-170SE) N862RW Cleveland-Hopkins International Airport, OH (CLE)". aviation-safety.net. Retrieved 26 October 2016. ^ "ASN Aircraft accident Embraer ERJ 190-100 IGW (ERJ-190AR) HK-4455 Santa Marta-Simón Bolívar Airport (SMR)". aviation-safety.net. Retrieved 28 October 2016. ^ Wivell, David (2010-08-25). "Safety concerns raised about China crash runway". The Seattle Times. Associated Press. Retrieved 2010-12-18. ^ "ASN Aircraft accident Embraer ERJ 190-100 IGW (ERJ-190AR) HC-CEZ Quito-Mariscal Sucre Airport (UIO)". aviation-safety.net. Retrieved 28 October 2016. ^ "Mozambique Airlines plane crashes in Namibia, killing 33". Reuters. 30 November 2013. Retrieved 30 November 2013. ^ "Investigation indicates LAM Mozambique E-190 crash could have been deliberate". atwonline.com. Retrieved 25 January 2015. ^ "Accident: Skywest E175 at San Antonio on Dec 4th 2016, nose gear collapse on landing". avherald.com. Retrieved 2017-01-10. ^ "Mexico plane crash: Aeromexico flight with 101 people on board crashes in Durango". 31 July 2018. ^ "E170 Cabin" (PDF). Embraer. June 2013. Archived from the original (PDF) on 2014-08-01. ^ "E175 Cabin" (PDF). Embraer. June 2013. Archived from the original (PDF) on 2016-03-04. ^ "E190 Cabin" (PDF). Embraer. June 2013. Archived from the original (PDF) on 2014-03-27. ^ "E170 Weights" (PDF). Embraer. June 2014. Archived from the original (PDF) on 2016-03-04. ^ "E175 Weights" (PDF). Embraer. June 2014. Archived from the original (PDF) on 2016-04-17. ^ "E190 Weights" (PDF). Embraer. June 2014. Archived from the original (PDF) on 2016-03-04. ^ "E195 Weights" (PDF). Embraer. June 2014. Archived from the original (PDF) on 2016-03-04. ^ "Embraer ERJ 170 Type Certificate Data Sheet" (PDF). EASA. 26 Jul 2016. ^ "Embraer ERJ 190 Type Certificate Data Sheet" (PDF). EASA. 15 Mar 2016. Archived from the original (PDF) on 2017-04-13. ^ "E175 Engine" (PDF). Embraer. June 2013. Archived from the original (PDF) on 2016-03-04. ^ "E190 Engine" (PDF). Embraer. June 2013. Archived from the original (PDF) on 2016-01-09. ^ "E195 Engine" (PDF). Embraer. June 2013. Archived from the original (PDF) on 2016-03-04. ^ "E170 Performance" (PDF). Embraer. June 2014. Archived from the original (PDF) on 2015-07-01. ^ "E175 Performance" (PDF). Embraer. June 2014. Archived from the original (PDF) on 2015-08-24. ^ "E190 Performance" (PDF). Embraer. June 2014. Archived from the original (PDF) on 2014-11-13. ^ "E195 Performance" (PDF). Embraer. June 2014. Archived from the original (PDF) on 2015-05-01. "Embraer 170 Airport Planning Manual" (PDF). Embraer. 9 Oct 2015. "Embraer 175 Airport Planning Manual" (PDF). Embraer. 9 Oct 2015. "Embraer 190 Airport Planning Manual" (PDF). Embraer. 9 Oct 2015. "Embraer 195 Airport Planning Manual" (PDF). Embraer. 9 Oct 2015.